^^ She picked out her outfit. I got as far as the piggie tails and her shirt before she took over and insisted just a diaper, her Aerial necklace and pink boots. ^^Dash Trying to steal her snacks. She wasn’t very happy about it. 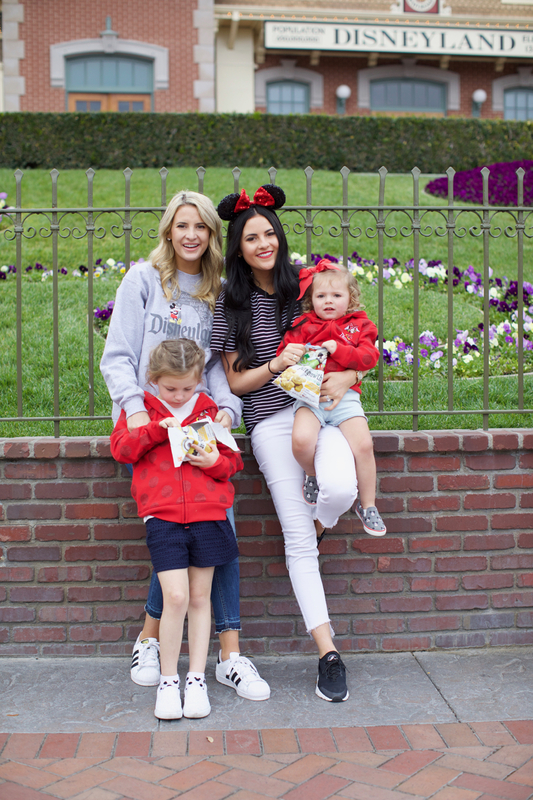 We got home from Disneyland with family earlier this week and we had such a magical time! It was so fun to experience it all over again through Isla Rose! She was wide-eyed the whole time and ran wild, Drew and I were exhausted after each day of chasing her down everywhere. That child has no fear! 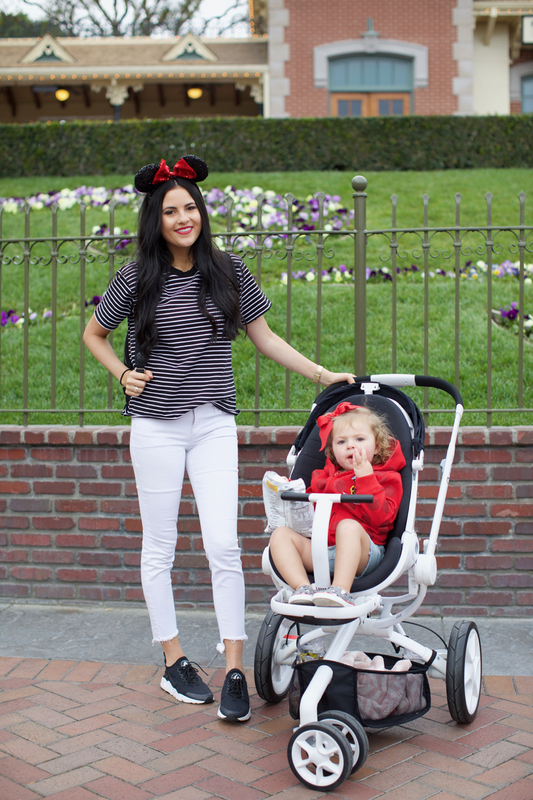 – Take a stroller that reclines and is comfortable (when we could tell she was getting tired we would lay her back and give her a bottle). She would get in a 30 min-hour nap at the park when we did this. – Bring snacks!!!! 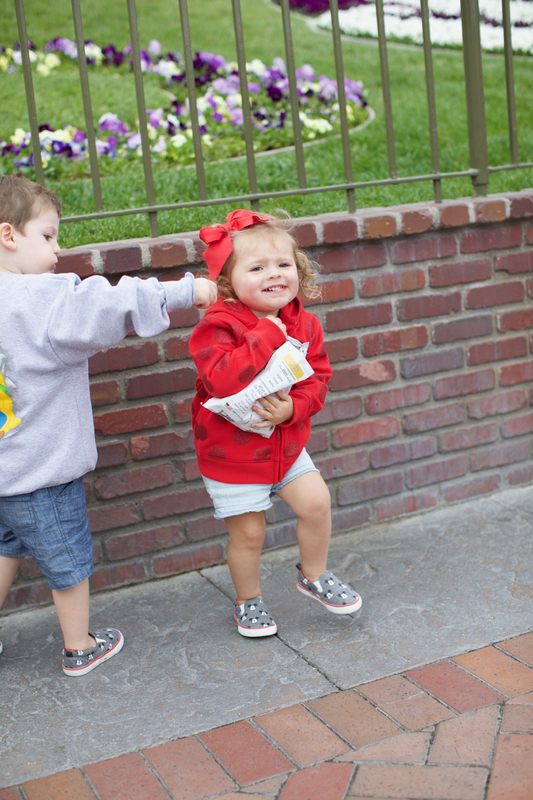 One of the best ways to a toddler’s heart are yummy snacks… At least in Isla and Cannon’s case! It’s hard to negotiate with a 2 year old but snacks always help. 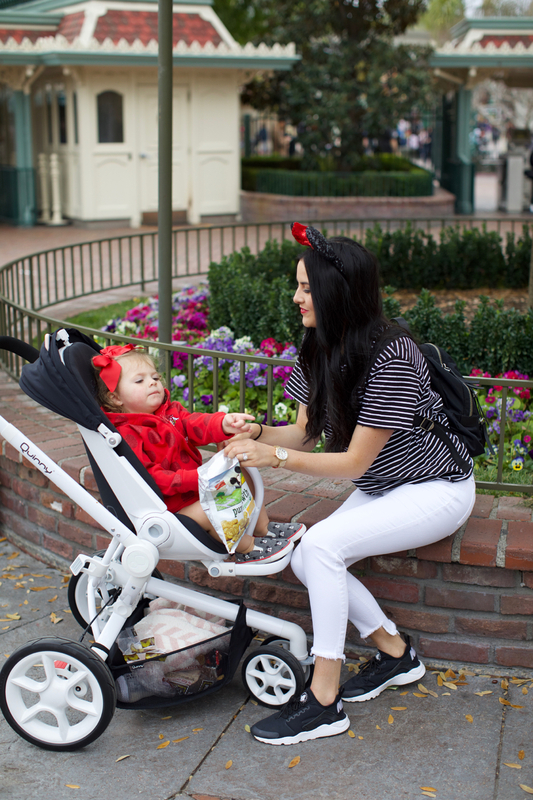 Last time we were in Disneyland I didn’t bring any snacks from home so we didn’t have many options, let alone healthy options to give to Isla. 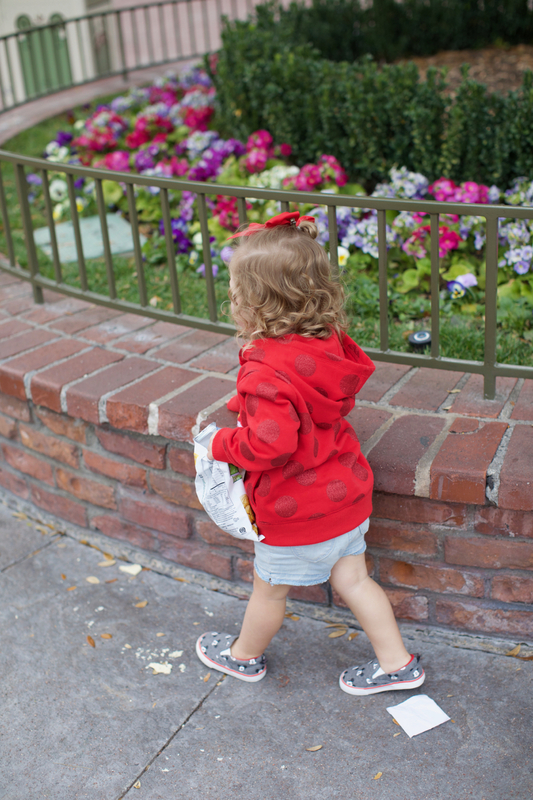 This time I packed a ton of different snacks for her so we could minimize the popcorn and churro purchases (although we still had a few!). 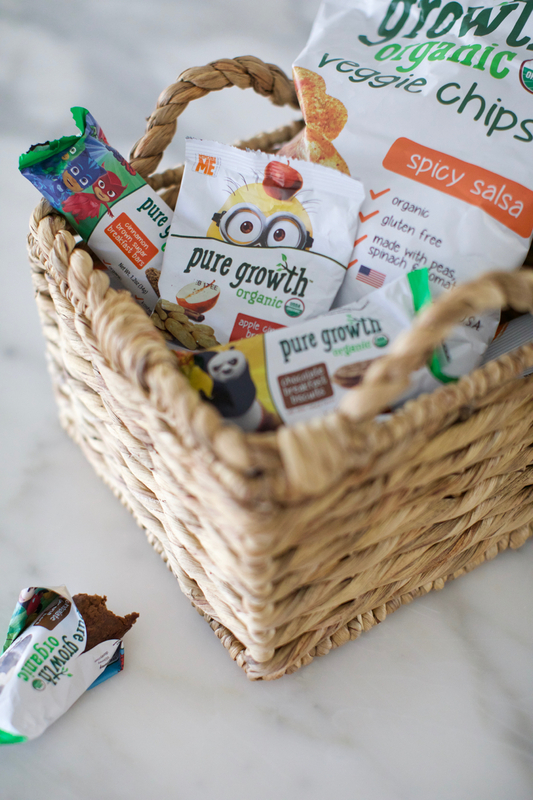 About a month ago Pure Growth Organic sent me a big box of snacks for Isla that I started taking them with me to church. Isla and Cannon (my nephew) went through them in a heartbeat so I had them send me more for Disneyland which was super fitting because they have Disney characters on them! 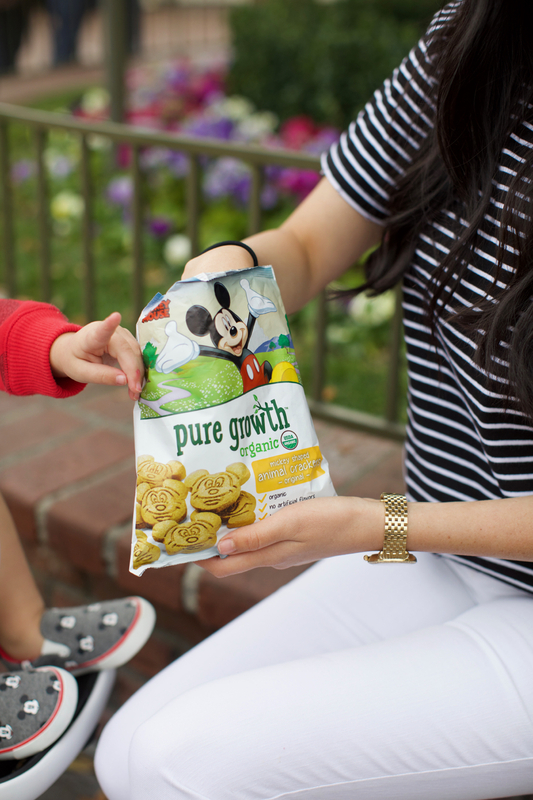 It was the perfect go-to treat for them on the plane and while we were in Disneyland, but they’ve also become a staple in my pantry. 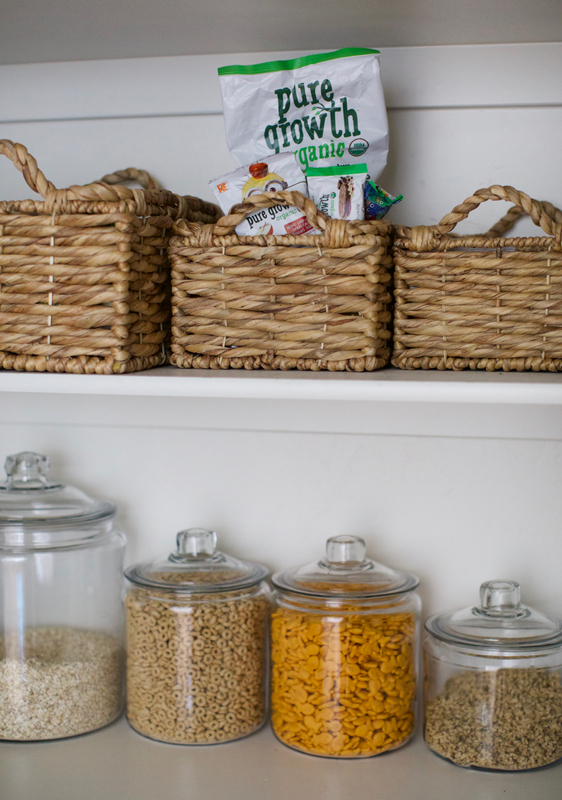 I keep a snack basket in my pantry (my favorite part of the pantry!! ;) and now we always have Pure Growth Organic snacks piled in there! 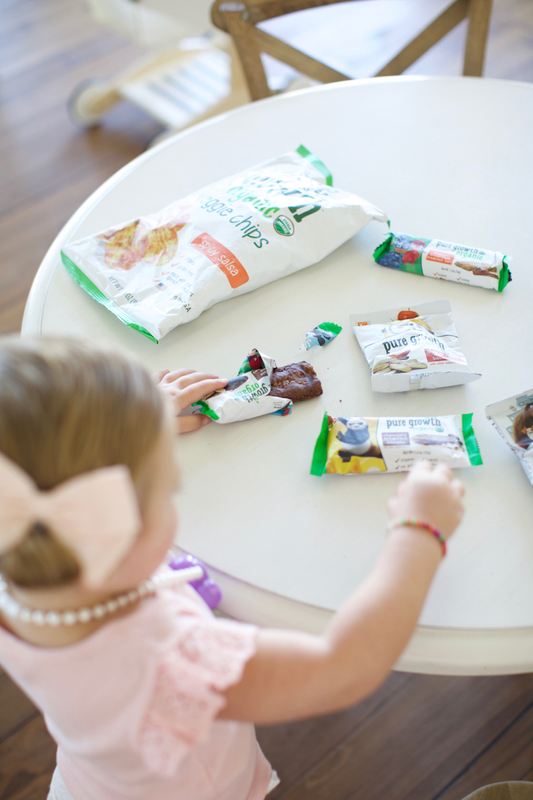 As a mom I’m super consciences about what snacks I give my kids. If there’s an organic option I always buy them so when I saw that these were organic I was really excited, plus Isla loves them! You can find them at Walmart and Amazon. 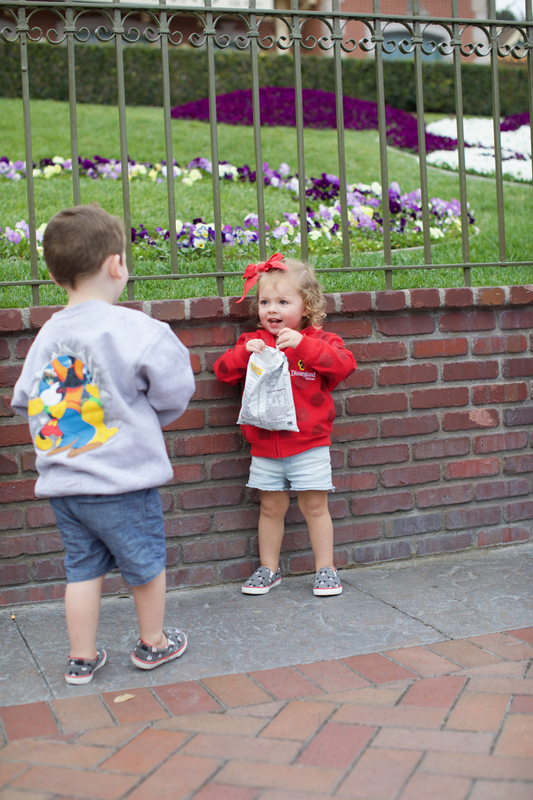 What are some of your traveling tips and favorite snacks for your kids? I’d love to hear! Brought to you by Pure Growth Organic. We went to Disneyland for New Years. I have to say, stay at the Disney Land resort in the park. It was a much closer walk with out having to ride a trolley plus, it’s much closer than the other resorts! Especially when traveling with small children. 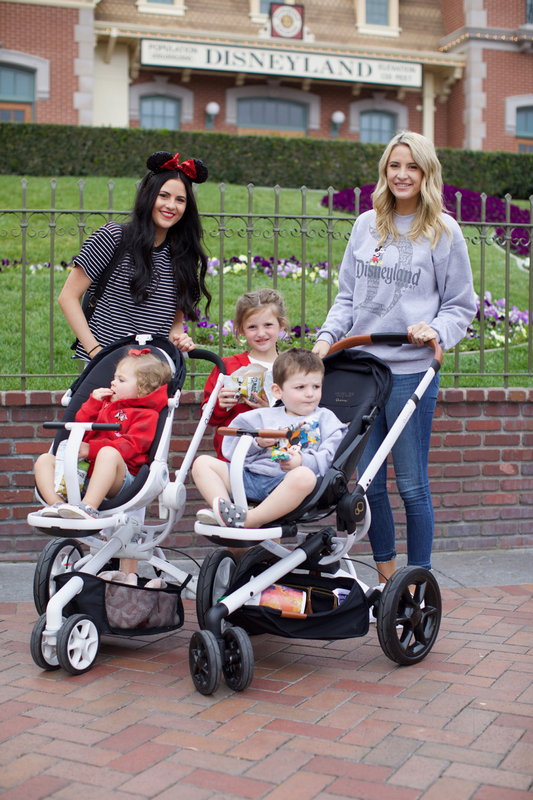 I agree on a stroller that reclines! That’s a must! Pack snacks as well! It poured on us so pack rain boots on your trip and a sturdy rain coat or poncho. Also pack a stroller rain cover ! We had to purchase the ponchos at the gift shops and the quality wasn’t as great. The good thing about staying in the Disney land resort was we could walk back to our hotel, change, take a nap and walk back once the kids were well rested. That trip to disney looks so much fun!! I love how your pics of Isla are “in the moment”, rather than staged. You do such a wonderful job of balancing blogging with motherhood…integrating life, rather than isolating for your blog. Keep up the good work! These family photos are just so cute! I’ll definitely have to keep this brand in mind because I’m currently 6mths pregnant and as you know, time flies! Most of the food we eat at home is organic, so we of course intend on feeding our little girl organic, too; I’m glad both Isla and Cannon love them! Speaking of, they are just too cute and you can definitely see how much Isla loves her snacks. The moment anyone looks like they’re digging in, you can see she’s not happy about it all over her face, it’s too cute! Thanks for sharing and I hope you have a great weekend ahead! Congrats! So exciting!!! You and your baby will love them as soon as he or she is old enough! That picture of Isla Rose giving Cannon a kiss on the cheek is soooo adorable! Glad you guys had such a wonderful trip! I know, they are really the sweetest friends! Thanks! 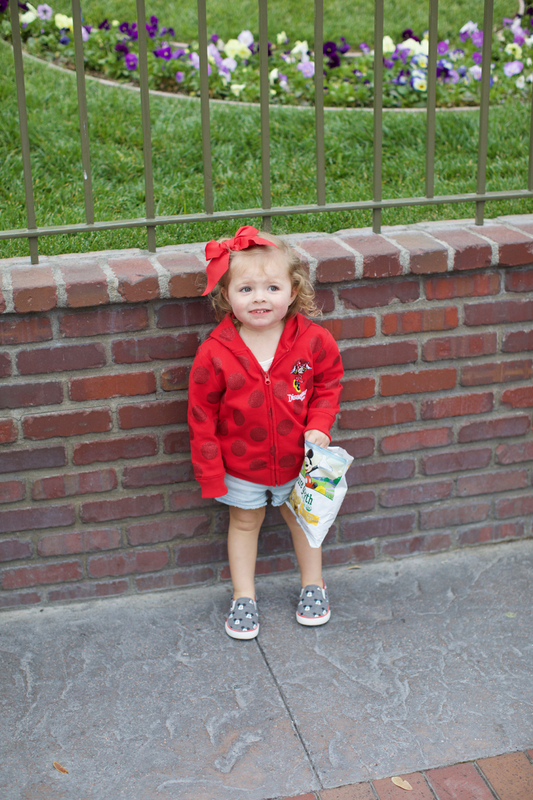 Love Disneyland especially with kids! Thanks for sharing and have a great weekend! These are perfect! I’m going on a trip to Disney early June with my family and my 18 months daughter. Going to check these out!! That’s such a fun age to go! You will have so much fun! Hi Rachel! I LOVE your TopShop shirt! I’m looking to buy it, but was curious as far as sizing. I’m normally a small, is it still baggy in a size 0? Those photos of Isla are so cute!! Sounds like a really fun trip! I love Disneyland. We are buying season passes next month and I can not wait. I will keep these tips on file for when we start going! Thanks. So exciting!! I wish we lived close enough for season passes! How fun! Oh my gosh how awesome!! This looks like so much fun! 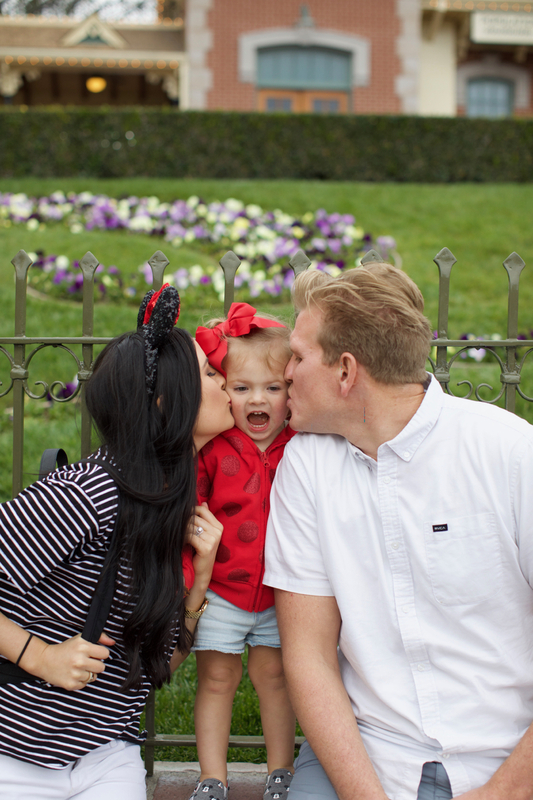 You guys are so cute, especially islas face when you and drew are both kissing her on the cheek! Haha so funny! I love that one! Thank you! She is absolutely adorable! Her little curls are too die for! Thank you!! I don’t know where she gets them, but I do love them! Gorgeous photos! 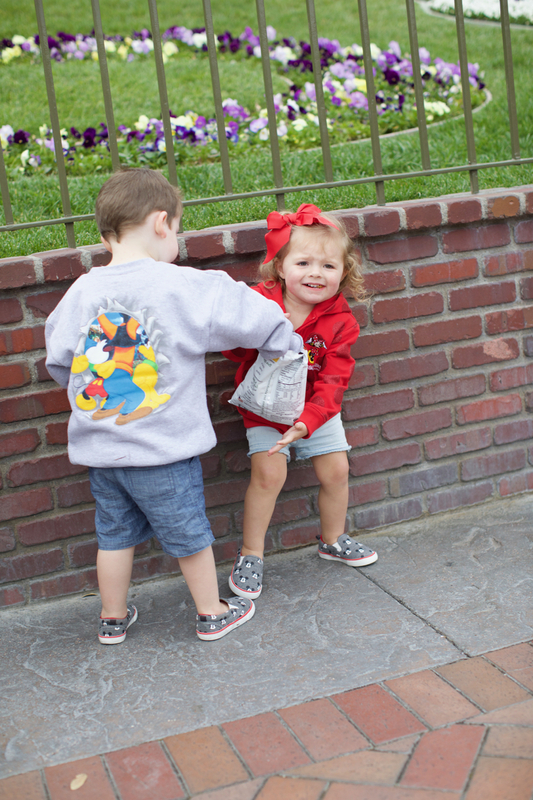 I love all of the matching Disneyland jumpers & ears! So cute! OMG I’m obsessed with those Valentinos!!!! Love how you styled them! Hi Rachel! I love your blog ? I want to go to Disney with my toddler by April, which park do you recommend me? He’s the same age as Isla and has the same energy. Let me know please and thank you ! We love the Disneyland Park! It is so kid friendly and always such a fun time! ME TOO!!!! It goes by way too fast though! I’m a longtime reader, first time commenter :) I love your blog and respect you as a working mother. 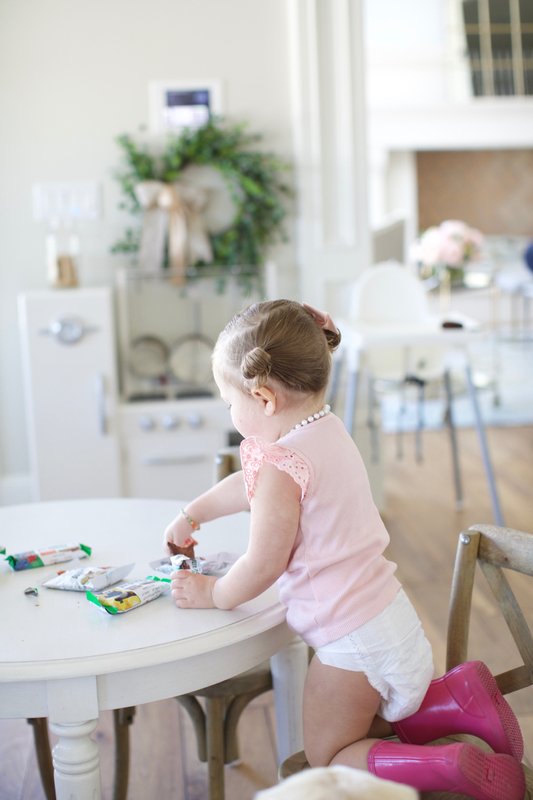 I have always been curious…do you have a nanny or childcare help ? How do you do it all? You seem like super mom….so inspirational!!! Those matching little shoes are killing me. Love this post! 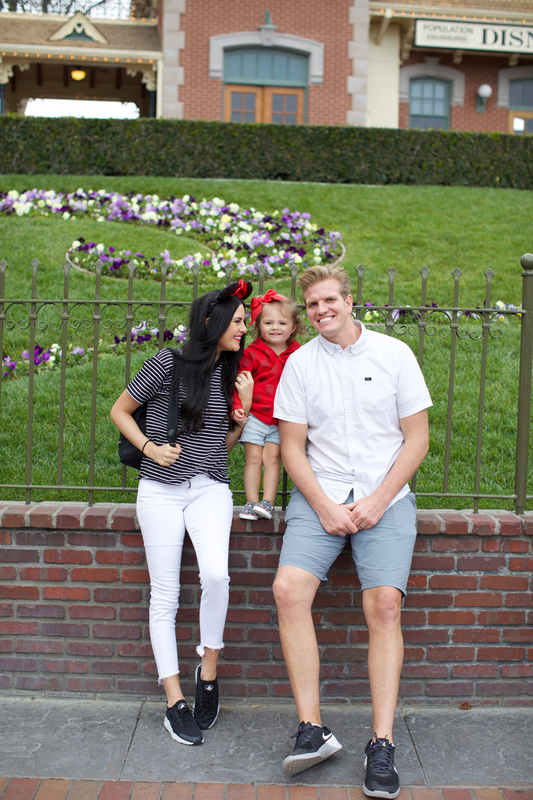 We’re Disneyland pass holders, but we’re always looking for new tips and tricks to make our visits more enjoyable with our toddler and now new baby! Definitely going to check out those snacks. They look yummy! I’m so jealous you have passes!! I wish we did! Oh my goodness! How adorable is little Isla! I hope you all had an amazing time at Disneyland! I love your outfit, especially those Joe’s Jeans. Can you tell us if they fit true to size, or slightly small or big? Thank you! Isla is so cute! Love her diaper outfit. We haven’t been to Disney yet but are planning a trip soon. Love the tips- thanks! 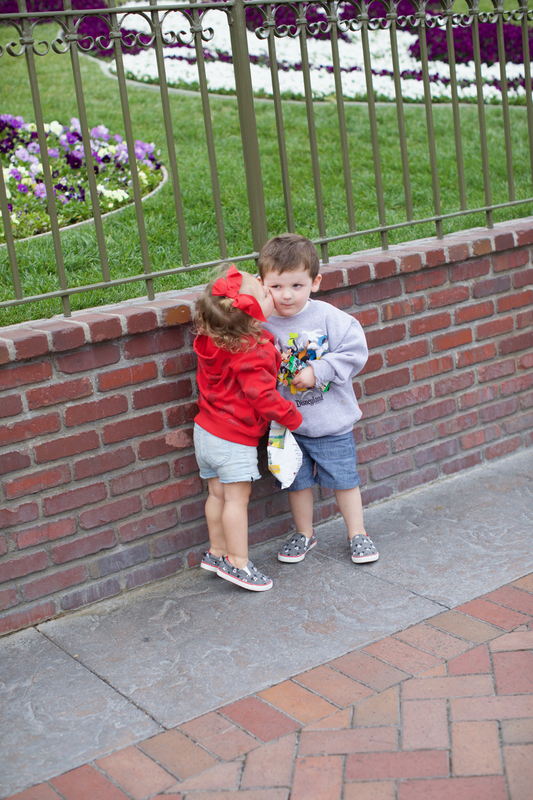 Huge lol at Isla and Cannon fighting over snacks and then the sweet kiss <3 Dying. Oh, thank you Alyson!!! So jealous you are headed there in May! Have SO much fun! Hahaha someone looks like they didn’t want to share their goodies!! Love seeing that you guys are super close!